Thus when I lament in my blog any Baku building being demolished or something else, in order to understand it, you should be born and live in Baku. And now, I am going to lament again - after finishing the demolition of Baku's pre-1917 oil-boom architecture, the vandals started to ransack its Soviet heritage. There are a lot of fascinating links in the post -- doings of Baku oil barons, including the Nobels, etc. Do go read the whole thing. Fred over at Real Debate WI has some very interesting questions about Governor Doyle's big train purchase. I didn't realize this, but there is already a company in Milwaukee that makes trains for the Chicago Metra line. Was that company, Super Steel, given a chance to bid on the contract? There are some very good questions that Fred asks on his blog. Something tells me that Governor Doyle is either going to have to answer those questions - whether now or during the campaign next year. This shouldn't just go away. ...is EAA -- for a little while, anyway. I was there today -- mostly as a volunteer in the International Visitors Tent; but I walked around a bit. Here's some of what I saw. 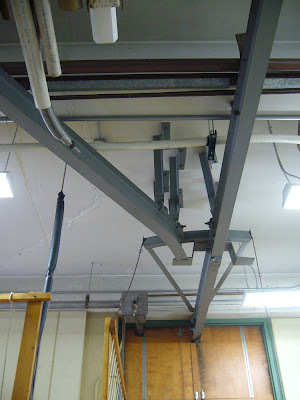 There is a ceiling railroad that runs through the lab rooms. On it are several pulleys for lifting and translating heavy things. So, apparently there is going to be some kind of get-together at the White House today. Something about 3 guys who had a little spat sitting down over a few beers - with their lawyers and union rep present, of course - to make sure there are no hard feelings. This is a very silly PR stunt and I think it is an incredible waste of time. Nothing will be gained. The President will be hailed by his supporters and bashed by his critics. Now, then, on to what really matters: what beer the 3 main characters will be drinking. According to the White House, Mr. Gates wants Red Stripe, Mr. Crowley wants Blue Moon, and the President wants a Budweiser. Really? No, seriously, really? Two of these guys live right outside Boston and the President went to Harvard and you're telling me no one wants a Sam Adams? You've got to be kidding me. I'm not saying that there's anything wrong with Red Stripe or Blue Moon - I do have serious issues with Budweiser - but it just strikes me as odd that no one wants one of the hometown brews. I can guarantee you that if this had happened in Madison - not that it would - the professor and cop would certainly be requesting something better and closer to home. Any of the Capitol or New Glarus selections jump quickly to mind. As for the President's choice, I think that on behalf of all true beer lovers - and the best beer state in the country - we should send the President a gift of the best beer Wisconsin has to offer, because it is frighteningly clear that he needs help in choosing a good beer. Conservative bigwigs are lining up to take shots at the odious "Birther" movement. A pity they haven't been doing this since the movement began, but better late than never. As an aside, the claim that Obama brought this on himself don't hold water for me -- his refusal to simply release the birth certificate speaks more to the pattern of secrecy evolving in his office than any worry about what the birth certificate would show. After reading this, all I want is a big steak. I wonder why? Apparently Ezra Klein doesn't think much of eating meat. Of course, that is a value judgment, but he's the one being virtuous so I guess he gets a pass. For whatever reason, every time I hear these sanctimonious blowhards talking about how horrible it is to eat meat I suddenly crave a steak - or a burger, or a brat. Does anyone else find this absurd? I thought cars and evil SUV's and the Bush administration were to blame, not the steak I want for dinner. I also think immediately of a South Park episode about veal and the punchline of a Ron White joke when asked what he was doing to combat global warming: "I'm eating the cows - but I'm only one man." That and the classic line that if God had intended us not to eat animals He wouldn't have made them so tasty. Shatner channels Palin channeling Alaska. A newly purple-faced Yahoo and Microsoft take their vows. I'm excited by the prospect. While it means more convergence, it also means theoretical competition for Google in search, and possibly in other areas down the road. While the new relationship doesn't ensure the two participants will realize market share gains against Google (Yahoo might actually be a drag on the more dynamic Bing), there's a possibility for some residual benefits to consumers in the struggle. Personally, I think the Microsoft-Yahoo duo could make inroads in some competitive sectors if it emphasized personal privacy to a greater extent than Google. Is this a case of the stimulus working? I was sent this article from today's NYTimes about one Tennessee county where stimulus money has actually put people back to work. Much of the program is based on the New Deal philosophy of the WPA and CCC - basically, get people a paycheck now, not later. Over all, two-thirds of the new jobs are in private sector businesses, which are reimbursed by the state for the salaries of eligible stimulus workers. Some, in retail, might be hard to sustain when the stimulus money runs out in September 2010. Other businesses say the free labor will help them expand, hopefully enough to keep a bigger work force. I have been a big critic of the stimulus bill and the bailouts, but if we the goal was to put people back to work as fast as possible - especially doing meaningful work, not busy work - then I think Tennessee is doing things right. The stimulus bill, for all the glowing rhetoric behind it, doesn't stimulate or repair or recover anything. It doesn't contain systemic reform and too much of the money gets spent long after people have lost their jobs. As the story points out, or at least hints at, the stimulus is not a permanent fix. We needed to look at the bill as a pressure dressing or a turnicate applied to a wound. We were bleeding jobs and needed to stop the bleeding. Putting people back to work quickly - as in Tennessee - would then buy us time to address the systemic problems with the economy. What was passed, however, didn't do that. We just wanted to pass something to make ourselves feel better. I do have a question, though. Is this really the stimulus working? Is this - what is going on in this Tennessee county - an appropriate role of government in desperate economic situations? What-ho! A drove of dewars. I say, there in the center. By the way, James Dewar was a character. Also most of the country's helium comes from the area centered on Texas' panhandle. We hope it improves the blog reading experience. "highly significant for its timing and place"
In his parliamentary speech, Joe said all the right things. He explained what last month’s charter of strategic partnership was all about; thanked Georgia for sending troops to help out in Afghanistan and highlighted the significance of providing an alternative energy route to the west; he stressed that the US will never recognize the independence of Abkhazia and South Ossetia and supports the country’s bid for NATO; he reassured US commitment to help develop the military (much to Russia’s ire) and even quoted the eminent Georgian writer Ilya Chavchavadze: “My heart burns with a holy flame that all my strength I may employ, to serve my people faithfully in sorrow and in joy. O let my people's suffering be branded on my soul I ask, and let my heart, through good and ill, be equal to its task.” - not bad considering Joe had just been turned on to the great author only hours earlier. In Azerbaijan, I'd get regaled with the story of W's trip to Georgia probably once a month. Usually at weddings. All the ethnic Georgians I hung out with wanted to tell me about it, imitate it for me, show me poor-quality video on their cell phones. So I'm a bit glad that story got a mention here, however dismissive. Putting the cart before the horse. Or, putting the train before the tracks. A couple weeks ago, Governor Doyle announced the big deal he made with Spanish train company Talgo. The state shelled out $47 million dollars for two trains and (hopefully) 80 jobs for the state, all as part of some master plan for "high-speed" rail between Madison and Milwaukee and Chicago. People are apparently very excited about the whole prospect. Senator Robson issued a press release claiming that "once we have an established assembly plant here, we could be the train builder for the nation." While I would certainly welcome such a distinction, and the jobs that come with it, this all seems a little over the top. The Governor's own press release states that the "assembly and maintenance facilities are expected to create about 80 jobs for Wisconsin workers, with the potential for more jobs as operations grow." I'm glad we get 80 jobs, but for a town like Janesville - where Sen. Robson thinks the assembly "plant has plenty of space" (no kidding, it used to house a couple thousand jobs) - such an increase does little to help it's struggling economy. The big problem with the Governor's plans are the uncertainty of how many people will actually use the rail line. According to this story from the Wisconsin Center for Investigative Journalism, the train won't even travel faster than 70 mph until 2015. What incentive is there to take the train when it's possible to drive faster on the highway? Also, what sense does it make to have the train stop at the Dane County Airport when most people coming to Madison are probably headed downtown? Even the economic impact is far from certain. Most estimates assume that a larger, region-wide transportation system, even though the Governor admits that Wisconsin might be the only state looking at this right now. It's hard to sell a major investment on mere hope that other states will act. There is little evidence that a passenger line will be profitable either. Look at Amtrak and the billions of dollars lost each year there. One of the big selling points of trains has been that they will ease congestion on highways and decrease pollution, but the GAO released a study that seems to contradict those claims. The report highlights state that "research on rider and cost forecasts has shown they are often optimistic, and the extent that U.S. sponsors quantify and value public benefits varies." Furthermore, in testimony to Congress, the GAO's Director of Physical Infrastructure Issues, Susan Fleming summarized the report by stating "high speed rail does not offer a quick or simple solution to relieving congestion on our nation’s highways and airways. High speed rail projects are costly, risky, take years to develop and build, and require substantial up-front public investment as well as potentially long-term operating subsidies." Even with these findings, the Governor seems determined to jump head-first into the railroad business. This isn't a good thing and highlights a disturbing pattern in government: Rushing through legislation and spending so it looks like government is being productive. We saw this with the bailouts last year, the stimulus, cap and trade and health care this year. Even our state budget was rushed through with closed door meetings. What we really need is to slow down. We need to analyze all the information and all the reports and make sure that if we're going to do something like high-speed rail all the other states are onboard too. This isn't a go it alone type of thing, but that's what we're doing. I'm preparing to head to grad school in mechanical engineering. It's not at Wisconsin which is perhaps good, refreshing at least, for the blog. I recently spent the day there dotting the i's and crossing the t's, meeting people, and making arrangements. I took my camera along. From Wisconsin, it's somewhere south. Aim toward Memphis and drive for a while. So many farms! So flat! I wonder what it looked like in Lincoln's time. Maybe large areas were still prairie. Not before long I had arrived in Urbana-Champaign at the University of Illinois. Unfortunately, I was too excited and busy to remember to take some photos of the campus but there are some on the wikipedia page. It's all very nice down there and I'll still be blogging, probably, so it'll be coming next month. I've found that the best view of the skyscrapers in Chicago is from the south on I-94. There aren't any medium height buildings between the highway and the downtown so most of the buildings are visible. It's a good sign that since the last time I went to the city a few years ago there are several buildings I haven't seen before. I think the UW's Science Hall might be double-timing just south of downtown Chicago. Turn on your speakers...and take a look. New Amsterdance from Brad V on Vimeo. Numerous people have asked, and I feel I've failed to respond to the inquiries. New York is difficult to sum up in a meaningful way. Right now, it's loud with taxis honking and trucks rumbling. It's thundering in claps loud enough to set off car alarms. Though the lights are on, the flowers have been taken in for the night across the street at Adinah's Farm. New York is about planning how to get to the next event. It's about selecting an option from too many menus. It's about living more and reflecting less. When you're happy with friends, you're as happy as you can be - you're tied into the great, gleaming buzz of the city that towers around you, the warm laughter-filled candlelight somewhere nice where the steady traffic whispers by soothingly. It's hard to beat. When you're lonely, you're truly lonely - surrounded by an ocean of humanity and not a drop to drink, the sight of endless rows of diversions that have no meaning or lie out of reach on a solitary cab ride home. It's hard to beat. But the city, generally, is a colossal backdrop for the processes and trappings of life. I do feel the city needs to get its "oomph" back. Obviously, it needs to get beyond the financial crisis to the extent possible. It needs better subways. It needs more development. It needs to show its dynamism with more modern, iconic towers to rival the emblematic Chrysler Building and Empire State Building in the public mind. In particular, it needs to thrust something (more powerful than the current plan) skyward down at the tip of the island to fill what is both an aesthetic and psychological void where the twin towers once stood. I think a few images will help to give a better sense of the gist of New York in the summer of 2009. I've thrown together a little slideshow of sorts, and when I get it posted online, I'll be sure to share it here. Speaker Nancy Pelosi continues to drift somewhere far, far away from reality. And so on and so on. What’s so interesting about this is not that Georgia has a lively domestic politics—the years of protests and street marches is ample enough evidence for that. What is so interesting is that Georgian politics are playing out in Western publications, in English. There are probably a few reasons for that. Joe Biden’s recent visit indicates the U.S. still has some interest in the region. Many of Georgia’s elites were educated in the West, so they see that as a natural outlet for their politiking (similarly, Saakashvili has restricted independent media). But perhaps most importantly, each "side" of the Georgian political world relies on a sense of legitimacy in the West to thrive. I've been noticing a pattern lately in the Obama administration's fiscal ideas -- they have some short-term ideas, but the long-term gets fuzzy real fast. It seems reflective of the general Obama adminisitration outlook -- ad-hoc measures cobbled together in the desperation of needing to seem totally in control. It's something I touched on, if only glancingly, in my discussion of Obama's START treaty with Russia; it worried me in that context, and it worries me now. "In CBO's judgment, the probability is high that no savings would be realized ... but there is also a chance that substantial savings might be realized. Looking beyond the 10-year budget window, CBO expects that this proposal would generate larger but still modest savings on the same probabilistic basis," CBO Director Douglas Elmendorf wrote in a letter to House Majority Leader Steny Hoyer on Saturday. The problem is: Evidence suggests the Doyle administration, in its rush to take advantage of federal stimulus money, fails to recognize the importance of doing the homework. Furthermore, the Obama administration is providing little information for Wisconsin to look at before the state leaps into applying for federal aid to establish high-speed rail. All of this, of course, is reflective of the haphazardness of the overall stimulus bill, the basic idea of which was to throw a lot of money into a big hole. Most of the money remains unspent, doing nothing more than helping to make the hole bigger in the long-term. When I was a kid spending summers in northern Wisconsin, I'd dig "raccoon traps" -- small (well, big to me at the time, but I was 8) holes covered over with sticks and leaves, with a small piece of bait, usually a couple of crawdads scooped from the lake, to entice some furry critter. This reckless spending, with no thought of long-term fiscal impact, is in reality little more than a raccoon trap of a much bigger sort, with the power to put us all in a very real hole. The raccoons had no problem climbing out of the foot-deep holes I dug, to my disappointment; I wonder how Obama will feel when the trap he's laying finally springs. At least, that's what he says. Actually - apart from the irony of advocating "Kill the Rhinos!" when so many conservatives consider Brooks to be a RINO - this is a pretty good column. Brooks points out what few others in the mainstream media have: the current bills do nothing to control costs. Though I would much prefer a large caliber rifle to a "big heavy hammer," I think he's onto something. Now that the first wave of legislation is bogging down, you want to take the seeds of cost control and you want to do more. You want to eliminate or cap the tax exemption on employee health benefits. This is a big way to crush one of the core drivers of health care inflation. You’re willing to give MedPAC-style technocrats a chance to take control of Medicare spending away from Congressional spendthrifts. You want to loosen federal regulations so that states have more room to experiment — not tighten them, as the current legislation does, so that states have less. You want reforms throughout the system that will cut down on first-dollar reimbursement in exchange for catastrophic protection. You want to tie Medicare subsidies to income. You want to look at anything that will move us away from a fee-for-service model, the core perversion in the system. You want to change incentives at both ends. The legislators who drew up the first bills want to change the provider’s incentives. But big cost savings can also come if consumers have choices and incentives to hunt for cheaper coverage. The Wyden-Bennett bill gives people a chance to choose the best option, instead of imprisoning people in existing coverage, as the current legislation does. The Medicare Part D Reform has produced impressive reductions by allowing consumers to pocket prescription drug savings. Other proposals would give people tax credits and allow them to go to any trusted community group — like AARP or a union or a religious group — that wanted to compete to offer coverage. Basically, Brooks wants competition, not centralized control. He's absolutely right. That that Elliot guy is pretty dang classy. "We all want to fix what's broken in health care, but we need to get it right. Let’s get input from our employers – the constituents we represent – before we’re forced to vote on a thousand-page, trillion-dollar bill that will exacerbate our fiscal crisis, impose crushing new taxes on all Americans, and violate the President’s claim: ‘If you like what you’ve got, you can keep it.’ After hearing from those we serve next month, we can come back with a renewed commitment to advance patient-centered, fiscally-responsible health care reform." For anyone who has watched Band of Brothers, you know that name and that the nation lost a true hero last month. I found this while randomly surfing the Internet and I wanted to share it with you. We need to remember all the men and women who served our nation in war. Unfortunately, the men who served in WWII and Korea are beginning to die off. There are fewer and fewer left each year. So please, the next time you see an old man with a WWII or Korea or Vietnam hat on, or see someone you know served and fought for our country; thank them. Tell them thank you for their service and their sacrifice. I promise you won't regret it. Suspended vacuum chamber lids. It's getting Escheresque in here. A few thoughts on health care "reform"
The premise for all of the reforms floating around Washington - and even in Madison - is that health care is too expensive and the costs are rising faster than we can afford to pay. I don't think that any serious person is going to argue that doing nothing is acceptable, but this rush to pass something - anything - is remarkably dangerous. As I mentioned in my last post about health care, the bills currently being written contain provisions that most people would recognize as bad ideas. And more keep on popping up. The whole debate in the comments of that previous post bring me to something I think needs some reinforcement: According to "Anon3" - whoever that is, but who seems to have at least read parts of the bill - the bills currently in Congress would standardize all health care plans and essentially prohibit new policies from being written after 2013, but that's okay because the government has created this nice big pool of standard, government-approved policies. Sorry, but that doesn't exactly leave me with a warm fuzzy feeling. My point here is that no matter what the Democrats in Congress or the President call the final piece of legislation it will be a massive expansion of government control in health care. Basic economics take over at this point. If the "exchange" is a pool of approved health policies, what incentive is there to offer anything more than the standard plan? None. Eventually we will have a one-size-fits-all health care policy, the contents of which having been decided by whomever it is in the Commissioner of the Health Choices Administration's office. Yes, as has been pointed out ad nauseum by supporters of this horrific bill, insurance companies and HMO's are already making decisions for patients and interfering with the process of getting the best care for the best price, but these bills do nothing to change that problem. All they really do is replace insurance companies and HMO's with the federal government. The solution is not easy and certainly complex, but I see it having a much greater impact on costs and choice than any government plan. We need to require cost transparency in medical bills so that patients see where their money is going. We also need to break the control of insurance companies over which doctor and which hospital a patient can use. We need to allow consumers to purchase health insurance across state lines so that insurance companies actually have to compete and innovate. These are not silver bullets and there is certainly much more that would need to be done, but the goal has to be putting the patient in the driver's seat. One last point for now: Any discussion of controling the costs of health care or health care reform is useless without major changes in Medicaid and Medicare. These entitlement programs are the 800 pound gorilla in the room and they need to be addressed if we are going to make any progress. What was the greater human accomplishment? Megan McArdle's commendable post on the 40th anniversary of the moon landing got me thinking. Which was the greater accomplishment by mankind - landing on the moon or splitting the atom (and later fusing it, etc.)? Or is it something else that represents "the most magnificent single feat our little tribe of East African Plains Apes has ever managed"? This wise and welcome counsel, however, gets lost in loose talk about redistribution schemes and global governance. The encyclical seeks support for poor countries “by means of financial plans inspired by solidarity.” It calls for “a worldwide redistribution of energy resources.” It envisions the “large-scale redistribution of wealth on a worldwide scale.” How do Biblical teachings on justice and charity support these goals? Does political prudence suggest they should be attempted? We are not told. Neither is there enough attention to the great obstacles to economic development—political oppression, corruption, bad governance, illiteracy, disease, and war. All told, the redistribution of wealth gets far more papal ink than the creation of wealth. The encyclical eventually drifts into the realm of fantasy. What to make of a possible Liz Cheney run for Congress? On the one hand, the mystery of her views on most domestic issues could give heart to the libertarian-inclined Republicans who are cheered by her father's views on gay marriage. I suspect -- based on pretty scant evidence, granted -- that she'd be a powerful voice for a more libertarian-oriented domestic policy, both fighting against the Obama fiscal goals but able to use her conservative credentials and her district's interests to push for greater liberality socially. She'd have a strong hand to push Republicans in the right direction. And, as one of the above-linked pieces notes, she could form some powerful links with DC thinktanks to bring a greater degree of intellectual heft back to a party that has largely given that in in favor of Joe the Plumber and "you betcha." Her foreign policy platforms, however, and her defense of some of her father's policies vis-a-vis the CIA are much more worrisome. The torture program the CIA conducted is rightly reviled, and the closing of Guantanamo is the right thing to do. I won't comment on the specifics or the political implications of this speech by Secretary Gates, but it is well worth your time. Please go read it and think about how important it is to have this man at the Pentagon. Some have called for yet more analysis before making any of the decisions in this budget. But when dealing with programs that were clearly out of control, performing poorly, and excess to the military's real requirements, we did not need more study, more debate, or more delay - in effect, paralysis through analysis. What was needed were three things - common sense, political will, and tough decisions. Qualities too often in short supply in Washington, D.C.
All of these decisions involved considering trade-offs, balancing risks, and setting priorities - separating nice-to-haves from have-to-haves, requirements from appetites. We cannot expect to eliminate risk and danger by simply spending more - especially if we're spending on the wrong things. But more to the point, we all - the military, the Congress, and industry - have to face some iron fiscal realities. Well, I haven't changed. I did not molt from a hawk into a dove on January 20, 2009. I continue to believe, as I always have, that the world is, and always will be, a dangerous and hostile place for my country with many who would do America harm and who hate everything we are and stand for. But, the nature of the threats to us has changed. And so too should the way our military is organized and equipped to meet them. In the NYT, Ross Douthat concedes a bit too much on affirmative action for my taste, but he does make a perfect pitch given his audience. As Azerbaijan is shifting its orientation toward Russia, its domestic policy also turns to be more and more authoritarian. It looks like by crushing the political and civic institutions in the country the Azeri government is making sure that there will be no political force left in the country to challenge its political decisions. The whole thing is fairly brutal, and worth your time. In the new GQ City Guide. "But those toxic assets are still there." Here's a rather clear synopsis of what went wrong with securitization that led to the financial crisis of the past year. The authors make an excellent point: for all of the money and bluster expended, all of the government's actions thus far have failed to target precisely the toxic assets that actually lie deep at the root of the crisis. The authors conclude with a two-step proposed solution. They say mandatory government-enforced disclosure should follow an attempt by some unnamed force to get the issuers of various asset backed securities to voluntarily disclose the precise nature of their complex securities in uniform fashion in a common database. While this approach makes some sense as far as finally addressing the true bones stuck in the craw of the system, I question whether the second step of government mandating disclosure should ever really be necessary. If the securities involved were so complex and almost entirely subprime after a certain number of slices and dices, the problem lies with rating agencies that continued to put a AAA rating on pieces of excrement swaddled in cheery wrapping paper and done up with a bow. And beyond that, the problem lies with investors who took the ratings as gospel. If some of the mechanisms involved were not private, well, some parties took risks and they should take their lumps accordingly. If toxic assets are still lurking somewhere in bank books (and they are), investors should demand transparency internally between themselves and the entity with the threat of moving money elsewhere if the entity fails to do so. If a financial institution is unable to ascertain the nature of the toxic assets on its books because it cannot determine the actual assets underlying its securities, then it failed somewhere along the line by giving in to the hubris of the market heyday. If so, it should reap now what it sowed. That's admittedly a bit of an oversimplification, but it is actually a better general outline for how to view the situation - as opposed to one where it appears everyone involved who took risks is somehow owed something. At the same time, American taxpayers are on the hook for what may well amount to the astronomical sum of $23.7 trillion to fix the financial system. I feel at times as though I've become a broken record here, but this kind of thing is bad for Wisconsin and bad for the country in general. One of the reasons that all of us here at LiB opposed the stimulus bills so strongly were all of the strings attached to the money by the federal government. Many people asked for proof of the strings, well here you have it. As Racine Unified School District officials decide whether to make cuts for the upcoming school year, they won’t be able to use stimulus money to make ends meet. More than $27 million of federal stimulus money has been allocated for education in Racine, according to Wisconsin’s Office of Recovery and Reinvestment.But little of that money can plug the $8.2 million budget hole created this month when Unified officials learned they were getting less state aid than expected, Unified Chief Financial Officer David Hazen said. This is the problem with centralized government power. Racine Unified can balance their budget with the stimulus funds if only the rules allowed them to do it. But that isn't the way the game works. Any money that comes from Washington - or Madison for that matter - is going to have strings attached and you can bet that they will not be in the local district's best interests. This is common sense. Who is more qualified to make decisions for the individual school district? Bureaucrats and politicians in Washington, or school board members and teachers? We need to end this type of "aid." It doesn't do anything to actually help school districts, if anything it strains relations between the school - and mainly teachers because they are the face of the school - and the taxpayers. They see a ton of cash coming into the district, but their taxes go up or something they care about gets cut because some moron politician knows best. Something tells me that Racine Unified is not the only school district this has happened to. "Of course, if I get to be in charge, then I’m all for this, because I think I’ll make all the right decisions. The other side won’t." That's the conclusion Lance comes to on government-run health care. Of course, such a conclusion and such an argument is ludicrous as a rationale for good government, yet it is exactly the argument that Democrats are making on Capitol Hill. They want us to trust them and the bureaucrats that nothing will go wrong because they have our best interests in mind. Perhaps I'm naive but it would seem to me that decisions about one's health care should be made by the individual and their doctor - not a bureaucrat in Washington and certainly not a politician. We've seen this in smoking bans, bans on trans fats, taxes that target certain behaviors, and a myriad of other issues. Anyone who thinks that government will be a benevolent actor in health care is kidding themselves. The marketplace may not be perfect, but with a few reforms it sure as heck beats the alternative. Healthcare just took another hit from starboard. Even with a recession on, I'll simply state that there's no shortage of things to do here if you're willing to look for a bargain. The PEKING moored at the South Street Seaport. West Side Story at the Palace Theater on Broadway - fantastic (I've been a fan of the soundtrack for years, so it was a perfect introduction to the true Broadway productions). Kayaking on the Hudson at Pier 40 - for free. Lounging in the surprisingly varied terrain of Central Park, ringed by peaks. The tip of Manhattan from New York Harbor from aboard a sailboat. The Statue of Liberty at dusk. On the event of the Weinermobile crashing into a home in Mount Pleasant, WI, I'd like to take the opportunity to discuss a trainwreck of another sort: that is, the Republican Party. Specifically, the far-right wing of said party. With charges of racism flying thick around a Young Republicans election, new evidence of the American Conservative Union looking for pay-for-play kickbacks, and the failure of the "Birther" movement to shrivel up and die the nasty and unpleasant death it deserves, you'd think somebody would be trying to do something to build roads into new constituencies. Well, there is. Meghan McCain has been one of the few real voices trying to push the GOP in a new direction -- one that, by embracing its basic libertarian ideals, would open the doors to accepting gays. Of course, the same knuckle-dragging morons who think they're great because they post pictures of "hot babes" call her ugly. These are the same people who push Palin at every opportunity. These are the same people who were happy to hamstring the real McCain because he wasn't conservative enough. They are people with bankrupt ideas and no arguments. And yet they still hold this snakecharmer power over a party that continues to shatter into irrelevancy because of their grip on it. The Open Championship - it is not the British Open, but the Open - is one of my favorite tournaments to watch during the year. Watching the best players in the world struggle against the wind and rain in the birthplace of golf is something truly special. This year's Open Championship is shaping up to be one for the ages and is the reason I love golf. One of the men tied for the lead is 5-time Open Champion, 59 year-old Tom Watson. In no other sport besides golf is this even possible. For some perspective, this is like Ryan Braun making the All-Star team 30 years from now. It would be as if Robin Yount were still hitting homeruns and making amazing plays for the Brewers right now. I've gotten to watch Watson's entire round today and I am simply amazed. He battled back from 5 bogeys in 6 holes to still shoot level par and a share of the lead. He made three monster putts for birdie - including one on 18 to cap off the day - and is hitting the ball as well as he did 30 years ago. It is really something to see a guy who won the US Open the year I was born still play this well. And that is why I love golf. Sure, there is some athleticism involved, but it is a game of skill and finesse, not of brute force. It's more about strategy and precision than your age. Very simply, it's a game that you can always try and improve. There is always the chance to have your best playing days ahead of you, not behind. I spotted some structure amongst all the scientific snarl. The bottom parts are cylindrical to fit in a dewar. 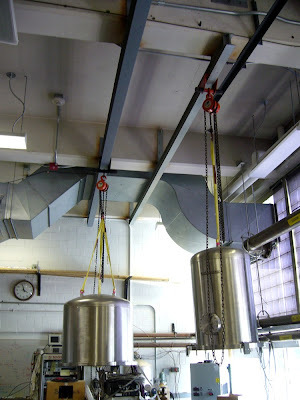 The rig hangs from a big disk which covers the top of the dewar and the air is pumped out. Vacuums are used in cryogenics because no heat can conduct or convect (technically some heat does make it) through space (but there is radiation) when there isn't any air so it's much easier to get and keep stuff really cold. I don't know in particular what most of these are for, but the rightmost one with three cylinders is used to calibrate thermometers. A certain gas works best for a certain temperature range so using three gives the instrument a wide range of reliability. But CBO estimates that in fiscal years 2009 and 2010, the federal government will record its largest budget deficits as a share of GDP since shortly after World War II. As a result of those deficits, federal debt held by the public will soar from 41 percent of GDP at the end of fiscal year 2008 to 60 percent at the end of fiscal year 2010. This higher debt results in permanently higher spending to pay interest on that debt. Federal interest payments already amount to more than 1 percent of GDP; unless current law changes, that share would rise to 2.5 percent by 2020. All I can say is I've been railing against excessive spending by the federal government since before the economic crisis, and I've continued my opposition all the more earnestly after it began. The post above makes a point that's been quite obvious for me: no matter what we do with spending now, we're structurally guaranteed additional future spending burdens due to entitlement programs currently in place. Fortunately, some responsible Congressional opposition leaders like Paul Ryan have been raising red flag after red flag on President Obama's healthcare push. The President's plan, unfortunately, doesn't actually alleviate the spending problem down the road in the entitlement realm. And it's likely going to require more government spending at precisely the moment we can't afford any more expenditures. The stimulus plan passed in February “is executing pretty much as expected,” yet it “won’t affect the economy’s primary problems, which are falling values of assets like homes and stocks,” said Doug Holtz-Eakin, who was director of the Congressional Budget Office from 2003 to 2006 and is now president at DHE Consulting LLC in Washington. So far, about $60 billion in spending and $43 billion in tax relief has been dispensed, accounting for 13 percent of the plan’s total. President obama will be next door this evening here in manhattan. for the heart of the sun? One of the ways we show our age? Actually it's the pre-electronic controls for a million pound test machine. These types of things were originally used to test locomotive parts. The little ship wheel controled the rate of force application. The rooms of my completely unrelated lab are on either side of this 3-story tall room so we cross through it often. Must We Regulate to Reform the Credit Rating Agencies? The SEC is proposing greater regulation of Wall Street credit ratings agencies. And talking of relying less on credit ratings generally. While I think the rating agencies got off remarkably easy in the public mind given their contributions to the economic crisis (perhaps because they're a bit obscure to be a clear target for many), I don't think the SEC effort will do much good. And even if the push does make rating agencies more responsible, it should not really necessary to have government involvement to achieve the same results. A credit rating agency's commodity is the accuracy or relevance of its rating of the riskiness of various securities and financial instruments. When a rating agency fails at that task, as many did in the economic crisis, they should be chastised by the market - the one product they sell failed, so who would rely on them again? Products that were not top grade products were rated as top grade products. Sure, the ratings agencies get paid by the issuers of the securities they rate, but the ratings agencies failed to overcome the conflict of interest themselves through some set of rigorous internal mechanisms or screens to ensure accuracy, the root of an agency's existence. Now, the government is going to prop up ratings agencies that failed by regulating them. Instead, those rating agencies that came up with the most rigorous internal mechanisms to overcome conflicts of interest with issuers should naturally rise to the top among issuers who want their securities not only to be given a top notch rating, but also a soberly accurate rating to avoid further negative consequences after the fall. Investors looking to purchase shares, too, should be pressuring issuers to use higher rating agency standards and insisting on more safeguards to avoid losses before purchasing. The SEC shouldn't have to intervene if market participants were simply being somewhat smart and self-interested (and they're taking risks backed with their dollars, so they should be held to that standard). The track records of various rating agencies should determine which rating agencies can actually be trusted to assess the proper amount of risk inherent in a given financial instrument or security. I understand the populist backlash at work here and the damage done by rating agency mistakes, but I disagree with using regulation as the proper response. Last time, I looked at the state of the oil game in Central Asia; now that things have had some time to shake out, I'd like to offer a few comments on President Obama's trip to Russia. It's been a mixed bag for Obama, but the situation isn't completely bleak. Obama's major goal, of course, was the inking of a new agreement to cut nuclear arsenals; in this he was successful. But it's a move that leaves me wondering about his goals for American foreign policy toward Russia -- indeed, it leaves me wondering if he has anything more than a vaguely cobbled-together cluster of ideas. Writing in the Telegraph, Nile Gardiner wondered aloud whether Obama was the "most naïve president in American history," going on to bemoan the possibility of "odious quid pro quo deal[s] Washington will have to sign up to in order move the agreement forward" and a strengthened Russian hand in its own near-abroad. This may be a bit much, but it is clear that for Obama, cutting nukes is a goal in itself -- a strange repudiation of the historical trend. Generally, agreeing to cut nukes is a strategy toward building cooperation on other, harder issues. The US would have to strike some deals, but presumably we get something in return. It is unclear what that something may be. "It was nothing more than an exchange of remarks over a specific suggestion," the source said. Nor has the trip calmed overall belligerence, with Russia test-launching two missiles from a submarine in the Arctic, leaving the Russian media to crow, "the Americans were unable to detect the arrival of two strategic submarines before the launch." Russia is also digging in its heels in Ukraine, refusing to leave its Sevastopol base. And today I want to say it boldly, that all their aggressive plans for the nearest perspective are foiled and there will be no war, as they imagined it, any more. Uzbek Senator Surayo Odilhodjaeva told RFE/RL that the proposed new base -- reportedly near the southern Kyrgyz city of Osh -- would not contribute to the security of Central Asia. "I think the less military bases we have in the region, the better," she said. Tanya Lokshina of Human Rights Watch said Estemirova's work was vital to uncovering abuses in Chechnya. She said Estemirova "was one of the main people who documented the most terrible crimes during the second Chechen war: torture, extrajudicial executions, abductions. Meanwhile, two Azeri pro-democracy activists have been detained on hooliganism charges after being viciously beaten while eating in a restaurant with some friends. The American embassy appears to be protesting, but to little avail. The latest issue of Wisconsin Interest - the publication put out by WPRI - has a sit down interview/debate with Scott Walker and Mark Neumann moderated by Charlie Sykes and Marc Eisen. My first impression upon reading the article is that this is going to be a fun primary. I'll go on record right now saying that I have no horse in this race. I'm inclined at this point to support Walker, but that owes more to do with the fact that I know him personally and that I believe him to be an honest and sincere man. I have no doubt that he is going to do what he believes is best for the state. I don't know Mark Neumann and have never met him, but I do know his resume and it's as impressive as Walker's. Not that any of this really matters. I have no influence in the GOP and my own thoughts are probably not going to sway anyone's opinion, but I wanted full dislcosure. For the most part, the interview featured standard conservative Republican talking points. This isn't a criticism, it's just that both these men are sincere conservatives who believe in their positions. The interesting part of the interview came when they were both asked about the future of the GOP and what type of message it will take to win in 2010. Walker's response was that essentially we need a new salesman. It isn't that the GOP message is broken or discredited, but that we have failed to communicate it and live up to it. There's a lot of truth to that statement. The Bush administration did a lot of damage to the Republican brand when it failed to live up to it's conservative "ideals." And when one looks at the Democrats who won in '06 and '08, many of them ran on platforms of fiscal responsibility and economic growth. If it's a problem with the spokesman, the case can be made. After all, look at Paul Ryan. He's wildly successful in a district that went decidedly for President Obama last year. Neumann's response to the question of message vs. messenger was quite different. He argued that it most certainly is time for a new message - not new principles or values, but an update of the traditional conservative message. This is something that has been talked about frequently here at LiB and it's an appealing argument. Neumann focused on his background as a business owner and talked a lot about green energy and green jobs. He argued that we need to reach out as a Party and voice an alternate path to a cleaner environment than cap and trade or the Governor's global warming task force. He emphasized using the private sector and entrepreneurism to create jobs, improve the state's economy and help the environment. From a tactical standpoint, it makes a lot of sense. I think most of us agree that conservative principles - especially economic ones - are still popular, but we need update their application for a new generation that doesn't remember Ronald Reagan. Throughout the interview there were a lot of subtle jabs at each other, nothing serious, but the two men are definitely feeling each other out and trying to pick the right critique to win the nomination. Neumann is going to stress his background as a businessman and a relative "outsider" to politics. I wouldn't expect him to talk too much about his time in Congress other than as a part of his breadth of experience. As for Walker, it's going to be his success in very liberal Milwaukee County and the fact that even though the County Board there has made life miserable at times, he has consistently put the conservative principles of lower taxes and less government into practice. The big difference between the two will be the message they use to appeal to voters. It's far too early to tell and the odds are still heavily in Walker's favor, but this is exactly the kind of primary the Wisconsin GOP needs. We are going to get a battle over the future of the party and the Republican brand/message. No matter who comes out on top, I suspect that they will be in a much stronger position than without a primary challenge. We are going to hear ideas and specifics. The primary will force both candidates to lay out their full agenda to the public and that's a good thing. I'm looking forward to it already. And please, go read the whole thing. The Economist reports from the frontlines, dateline Stanley, Wisconsin. A report from the US Department of Education shows that black Wisconsin students have the lowest reading scores in the nation and "among the lowest" in math. This is unacceptable. I've talked a lot here about creating a good climate for business in the state, but you know what else helps? An education system that works. Not a lot of companies are going to come to a state that can't educate their employees - let alone their potential employees' kids. Fixing the problem is going to take a lot more than more money or repealing the QEO. We need real, total reform and we need to start finding solutions very, very soon. We are undeniably in the midst of the worst recession in the last half-century. With luck, most of us will never see anything this bad again in our lifetimes. While Wisconsin's unemployment rate may be slightly better than the national average, there are parts of the state that are doing much, much worse. My hometown area is one of those places that is doing so poorly. In fact, I don't think it's much of a stretch at all to say that Beloit and Janesville are on the verge of economic depression if steps are not taken to improve the economic climate soon. In that context, let's look at the tax and fee increases in the state's new budget. The total damage is set at $2.1 billion over the next two years and that does not include the $252 million worth of tax increases passed in the budget "repair" bill earlier this year. The lion's share of these taxes hurt small businesses and discourage large companies from locating production facilities in Wisconsin. It makes no sense to me that we would pass these tax increases in the middle of a recession. Precisely when we need to encourage job growth and economic investment, we are punishing it. Rather than focusing on trimming the fat in state government and creating a climate in which business and job creation can flourish, we are doing the exact opposite. Let's just look at two real quick examples. This budget increases taxes on anyone earning more than $225,000 a year. I know that for some it's fun to punish the "evil" or "idle" rich, but it's not usually the best policy. Many of those caught in this new bracket may not be business owners themselves, but they most certainly represent a good share of those in the upper levels of management in many companies. Do we want to punish the best and brightest and perhaps force many to leave the state? Also, we know that at least some small business owners will be caught in this bracket. I know we're a broken record here at LiB, but the more money taken out of a business owner's pocket, the less he/she is going to have to invest in their company. That means a loss in jobs. An owner entity could create a separate transportation company solely to haul products for the owner. In the absence of the separate company, the owner would owe tax on its purchases of trucks, trailers, and other hauling equipment. However, the separate transportation company would have qualified for the sales tax exemption for vehicles purchased by common or contract carriers. So, what they're saying is that a "common or contract carrier" is exempted from sales tax in the purchase of all the things it needs to conduct business, but if a company - in order to cut down on the costs associated with contracting out their transportation needs - wants to create what amounts to a separate transportation division within its company, it gets screwed. Never mind the fact that jobs would still be created and the business may be able to expand, they're just trying to skirt the law and should be punished. After all, who needs jobs. These are no small increases either. The two changes alone amount to $327.8 million dollars in tax increases. There are a number of other bad provisions in this budget that create a massive problem for the state's economic and fiscal future. We have to find ways to attract businesses or at the very least encourage businesses to stay, but we aren't. Provisions like the elimination of the Domestic Production Activities deduction, the elimination of the deduction for "Thowback Sales," and the reduction of the Capital Gains tax exclusion account for another $377.3 million in new taxes and discourage investment and economic growth. I know that individual cities and counties can offer great incentives to attract business - like Beloit did for Kerry Ingredients - but that is no way to create a postive business climate. We cannot create jobs or improve the economy piece by piece, we need to make the entire state a good place to work. And like I said, there are a lot of bad things in this budget. Tomorrow I'm going to take on the issue of health care and how we are stifling reform and innovation. "The fence that surrounds the Bowling Green today is the original one erected ca. 1771." You may remember the tale or image of the American colonists pulling down the statue of King George III as the revolution unfolded, melting the equestrian work to make ammunition. Interestingly, the fence erected around the statue by the British in an effort to keep the colonists at bay survives to this day, near the tip of Manhattan amidst a grove of skyscrapers, silently ringing the Bowling Green, New York's oldest park. The Secret CIA Program - That's It? While ordering the CIA not to reveal the program to Congress is still a significant concern, I must say the nature of the program itself is less dramatic or controversial than I thought it was going to be given all the hoopla. The way it was described, I thought the project would have been something far more sinister, something that would make it look as if the U.S. was stooping to some truly depraved level - such as authorizing the use of suicide bombers to go after terrorist leaders. Notwithstanding all the international law issues and Jimmy Carter's non-assassination policy, I don't believe the American people as a whole will find the secret CIA plan all that odious. In fact, it might look like a better, more pragmatic alternative to launching two full-out wars when dealing with a hard-to-grasp terrorist network. Perhaps there are more repulsive details to emerge, but for now, I think the Democrats lose a good deal of wind they had filling their sails in the past few days. Stricker wins another one on the PGA Tour. I-10 Tear Down in NOLA? Why, WHY, does his last name have to be Bush? On Palin - Because How Could We Not Mention It? "a bright spot in the current recession"
Brevity? For politicians? That's crazy!